I don’t often write pottery blogs, but have meant to all along. We get caught up in work these days, don’t we? Being self-employed isn’t easy. Well, part of it is. It’s really easy to be hard on myself and take 100% of the blame if things aren’t going well. It’s also easy to think of myself as being lazy for not getting around to certain jobs like marketing or writing blogs. It’s easy to get down on myself if I’m behind in the grunt work that is ever present in a studio. It’s easy to feel guilty when I stop to rest, eat, practice yoga, take a walk or tend to my garden. A lot of things got put aside this year while I attempted to make quite a lot of custom ordered dinner plates – a total of 28 plates – in a 8 month period. I’m not quite done yet. It’s a cinch to make the plates. What is taking so long is the firing of said plates. It’s slow going when you have one 3 cubic foot kiln for bisque firing and one 7 cubic foot kiln for glaze firing. Every time I open a new issue of Ceramics Monthly and see some potter’s expansive studio space I am truly envious. My workshop is 2/3 of a standard garage that was built in the 70’s. The front 1/3 of the garage (which was converted to studio space in 2003) is where I have my gallery. Two or three customers can shop comfortably. It’s very…quaint…and we all know that that’s just another word for teeny weeny. I’m really “into” working with what I have. I have a small studio and small kilns and that’s just the way things are and it could change if win the lottery! Things have clearly gotten out of hand in my wee studio. How? You may ask. Well, I have a thing for trying to improve my pottery and that entails trying out a new clay bodies and new glazes. My interest lies in working with the clay body. I’m less interested in the decoration on a pot and instead spend my time on the architecture of making a great pot. Usefulness is key for me. It has to be useful or it doesn’t really spark my interest. Clay takes up space and so do large buckets of glaze. Even many smaller buckets of glaze take up space. Give me a bucket and I will make some glaze. A girl can never have too much colour in her life, right? Glazes provide not only colour but visual textures, depth, a sensation to the touch – some glazes are smooth and velvety and some are glossy and glass-like while others can be dry, rough, or even bumpy. With any experimentation you will have things that don’t work out, and I have many buckets of glaze mistakes that need to be discarded, so that is something that I started to clean up this summer. Yay! Experimenting with different glazes is something that I will always enjoy, so for now I’m just cleaning up so I have room for more experimental glaze buckets in the future. The biggest news here is that I’m dropping a few types of clay that I presently use. If you’re a collector of my pottery you might want to know which ones in case you were thinking of adding to your collection. Right now I’m working with a red earthenware clay, porcelain, four different types of high fire stoneware a mid fire buff stoneware, and a mid fire white stoneware. That is far too many clay types for my small space. There are scrap clay buckets lining one wall of my studio. There are lots of glaze buckets too as well as bags of raw glaze materials that are taking up valuable floor space that I could use to walk on, ya know? It’s a bit of an obstacle course in the workshop. The red earthenware has long been on my mind as a clay that I would like to phase out, so that one is first to go. I love the colour and I love working with the smooth buttery clay on the wheel, but in my opinion while earthenware clay is incredibly useful for many things it isn’t very durable. Earthenware is a soft, porous clay so it can chip easily if you don’t take care. In its defense earthenware clay is good for many things. It keeps things cool and moist if the clay pot is made wet, as in the case of a wine cooler. You can fill a wine cooler with cold water, let it sit for a few minutes, pour out the water and insert your bottle of vino and your wine will be cool til the last drop. If you’re in a hurry, grab a handful of ice from the freezer and toss it in the wine cooler and you are good to go! The ice will melt and the cold water will get sucked up by the earthenware clay keeping your wine cool. Earthenware is the only clay I use for the “fixer upper” wine cups I make. As you can see in the photo below, the cups are unglazed except for the edge where your lip meets it. That part is glazed so it feels nice on your lips, but if the interior were glazed that would defeat the purpose of the cup. You see, the unglazed clay is very useful at making crappy wine taste pretty good. How? When the wine comes in contact with the porous clay body it takes the edge off. The acid from the wine is absorbed by the porous clay. If you have one of my wine cups you’ve probably done a taste test at my suggestion. Try the wine in glass and then in the earthenware cup. There is definitely a difference, and a good one at that. In addition to the wine cups I have also made wine jugs for decanting wine. The same principle applies. Earthenware can keep things dry which is why I use it to make garlic jars. I’ve made a lot of garlic jars and glazed them and then used them as intended. I usually ended up with rotted or moldy garlic. This never happens to my garlic now because I keep it in my earthenware jar. The wine cups, coolers and jars only account for a tiny portion of my sales, so once the last wad of red earthenware is gone, that’s it. I used my up my last bag of red earthenware clay yesterday, but I recycle my scrap clay (the stuff that goes into the splash pan around the wheel as well as trimmings) which will yield another 20-30 lbs of that clay. 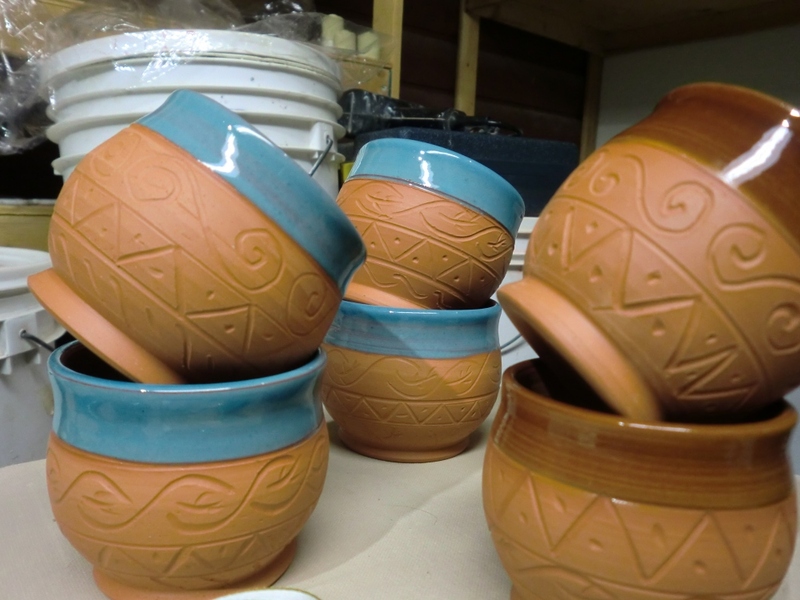 It will take about a year to phase out the red earthenware, so get it while you can. Next time: More clay types that I’m phasing out PLUS how to recondition dried up blocks of clay. This entry was posted in business, my work. Bookmark the permalink.